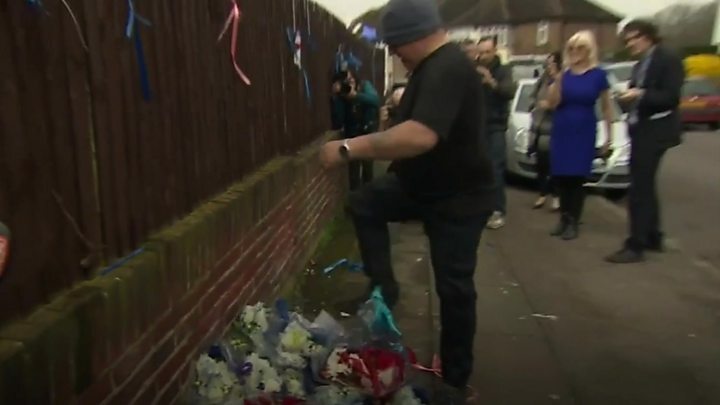 People laying flowers in tribute to a suspected burglar who was fatally stabbed should not feel intimidated, a senior Met Police officer says. Sir Craig Mackey, Met deputy commissioner, has also urged those placing tributes to Henry Vincent to be "respectful" to local people. The tributes have been repeatedly attacked and removed from a fence opposite the home where he was stabbed. Residents have described them as being "in poor taste". The row has put a strain on police resources, according to Sir Craig. The 37-year-old, along with Bill Jeeves is suspected of burgling Richard Osborn-Brooks' home on South Park Crescent - which remains cordoned off by police - on 4 April. 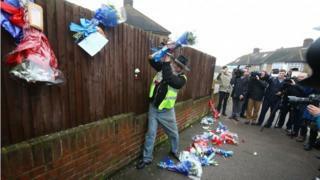 Since Mr Vincent's death the floral tributes had been appearing on the fence opposite Mr Osborn-Brooks' home. In the middle of Monday night the flowers and balloons were taken down and placed on the pavement by an unknown man. By Tuesday lunchtime the family of Mr Vincent - understood to be part of the travelling community - put them back up on the fence, however 30 minutes later a second man tore them down, put them in a pile and stamped on them. The tributes were reattached for a third time at 17:00 BST, but at 21:30 BST another man turned up and took away half of the bouquets. On Wednesday morning half of the fence was still covered with tributes, but these were stripped down at midday by another man and have been completely removed. Speaking on LBC the deputy commissioner said the Met was working with Lewisham Council to work out how to manage the tributes. "We want those laying flowers to respect the local people and the impact on them," he said. "Those opposed to the flowers should act responsibly, respectfully and reasonably. "As the borough commander said yesterday we don't want anyone - the local people or those visiting the scene - to feel intimidated." His comments come after Lewisham's borough commander, Ch Supt Simon Dobinson, urged members of the public "to respect the wishes of those who choose to place flowers and other tributes in the area." Stephen Langley-Hart, 72, a former resident of South Park Crescent, said: "They have the right to grieve even given the circumstances, but it could be done in a better way. It is really not terribly nice to have this thing opposite the house. It is a provocation. "The police really have much better things to do than guard a flower display. They should be doing other things but I hope it is not going to escalate. I really hope they're not going to come back."